Beverage processors and wholesale distributors, while part of the same industry, have different operational challenges to ensure the most effective warehousing and inventory distribution. Gravity flow solutions such as pallet flow racking, carton flow, bottle pick and keg flow can play a significant role in system processing and efficiency. We recognize that beverage processors will produce a high volume of single SKU products while a wholesaler might receive some high volume/low SKU items and some low volume/high SKU products. Both of these businesses are crucial parts of the same industry but each requires a different approach to warehousing and distribution to realize their throughput goals. Luckily there are several gravity flow products to fill each of these unique sets of needs. Pallet flow racking is an effective method of dense storage for FIFO inventory rotation. For processors who have high volume, date sensitive product, pallet flow rack is a perfect solution, offering deep-lane storage with SKU selectivity and automatic pick face replenishment for full pallet storage and selection. Take a look at a recent pallet flow test completed for a major craft beer producer. As you will see, our heavy duty pallet flow performed efficiently with both kegs and cases loaded on CHEP pallets. Pallet flow/case pick applications and pick modules offer a great solution for wholesalers for high case selection. The pallet flow lane provides dense reserve storage directly behind the front pallet position where cases are selected to either conveyor or pick cart. The Mallard case pick and flex pallet separators are designed to safely hold back the rear pallets until the front pallet is emptied and removed adding an extra safety measure to your hectic picking operation. A simple foot operated release allows the pallets to advance when it is safe for them to do so. For storage and order selection of individual, varied-sized kegs, Mallard’s keg flow racking offers space saving gravity flow storage. 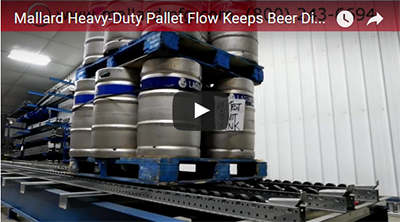 Keg flow still provides the benefits of gravity flow, such as FIFO inventory rotation, separate load and pick aisles, fast & easy SKU identification and the robust construction and abuse resistant components that ensure long-term usability. Bottle pick rack is designed as a push-back gavity flow solution to safely secure individual bottles and provide more efficient storage for slower-moving, each pick (vs case pick) SKUs. Bottle pick consolidates those slower moving SKUs into a smaller footprint thereby freeing up valuable warehousing space, while also keeping SKUs neat and orderly, thus increasing pick speed and accuracy. Bottle pick is easy to install by simply securing the individual flow lanes into standard selective pallet racking. The bottle pick rack can be used as stand-alone units or integrated with other carton flow and/or beverage storage shelving. When it comes to storing and picking lower volume cases or individual items, carton flow is the answer – whether stand-alone or combined with conveyor within a pick module, carton flow provides space-saving FIFO carton storage where SKUs are neatly organized for faster, more accurate picks. Cart-Trak carton flow is a full roller carton flow for consistently-sized beverage carton storage and fulfillment. The full-width roller design provides full carton coverage for consistent flow even when surfaces are not firm or smooth. Dyna-Flo carton flow is a full-bed of staggered polypropylene wheels which is ideal to accommodate different and frequently changing carton sizes. Dyna-Flo conveniently drops into existing pallet rack for easy installation. The Dyna-Flo line is a complete line offering HD solutions for heavy duty needs. Pallet flow ramp stop features 8″ rollers with heavy-duty, bolt-on ramp stop at the pick aisle prevents injuries and product damage by ensuring heavy pallets don’t pitch forward in the lane. The bolt-on feature ensures that any damaged stops can be easily replaced without replacing the whole lane. Both processors and wholesalers need to warehouse and process orders for fulfillment as efficiently as possible. We understand your needs and we’ve got the pallet flow and carton flow rack solutions to help. Give us a call today to speak with a gravity flow expert to get started.